Scholarly Gamers’ Mashup Wishlist series looks to toy with the idea of well-known developers taking a shot at established IP (intellectual property) that they might not be associated with normally. The source material could be a movie, TV series, or another game franchise that might be even better under different development. It should be noted that these are strictly exploratory and for entertainment only; there is nothing indicating that these mashups will ever take place. 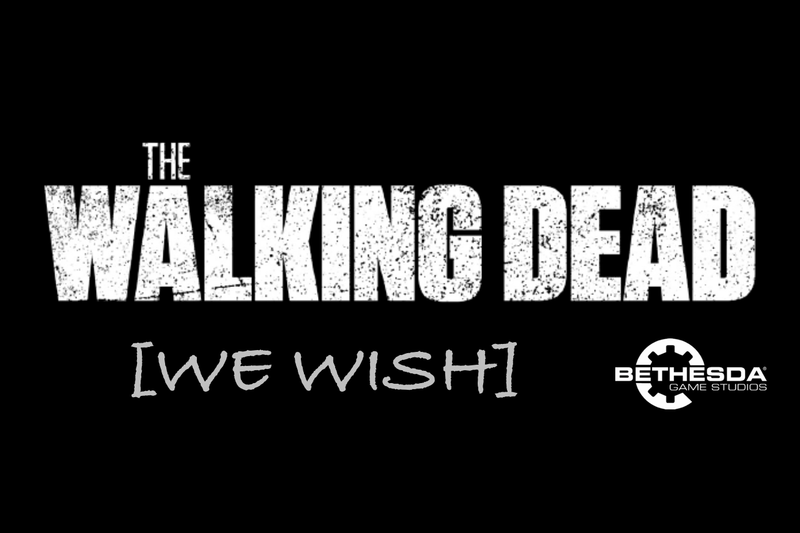 The first note that comes to mind in hoping for an open-world game using The Walking Dead source material may be, “But why do we need another zombie game?” Granted, the genre has been heavily utilized in recent years with major titles like DayZ, Dead Island/Dying Light, State of Decay, Dead Rising, and more, but Bethesda Game Studios has not directly tackled this subject matter themselves. The draugr of Skyrim and (feral) ghouls of the Fallout franchise may verge on the undead, but not quite as directly as needed to fit the ‘Romero-esque’ zombies employed in The Walking Dead franchise. It would be another step into familiar ground, but also give the option to focus on what they do best – world building. Smaller studios and independent modding communities have continued to fill out the fringes of zombie games while popularity runs high, though many have argued that such prevalence of the undead has left the genre oversaturated. Why, then, should Bethesda get a kick at the can? First, we need to note that the remainder of the article will primarily relate with AMC’s TV show, not the series of graphic novels. Secondly, we need to identify core facets of The Walking Dead that would need to be addressed in the game’s development. May 14, 2017: Searching for ‘zombie’ on Steam shows 1,049 games available for purchase or download. Storytelling in The Walking Dead has, typically, placed a focus on how human interaction might play out in a post-apocalyptic world. The zombies (though never directly referenced as such) serve as a secondary enemy that sets the ever-present sense of danger and horror that befalls those without the skill and fortune required to survive. In establishing the environment, however, wide-open set pieces, hordes of shambling corpses, and rolling wilderness terrain help shape the world that the characters work their way through in the unending struggle for their lives. Many sequences in The Walking Dead involve house-by-house scavenging, setting up camps in abandoned buildings, and fortifying against the undead horde in whatever structure is available at the time. Whoever finds themselves tasked with ushering in a new entry to the franchise would need to show that they have proven capable in crafting set pieces in both large and small-scale implementations. Beyond the world creation, however, another highly-important facet for the developer to consider is weaponry and how scavenged materials can be used to inflict self-preserving damage against the undead. 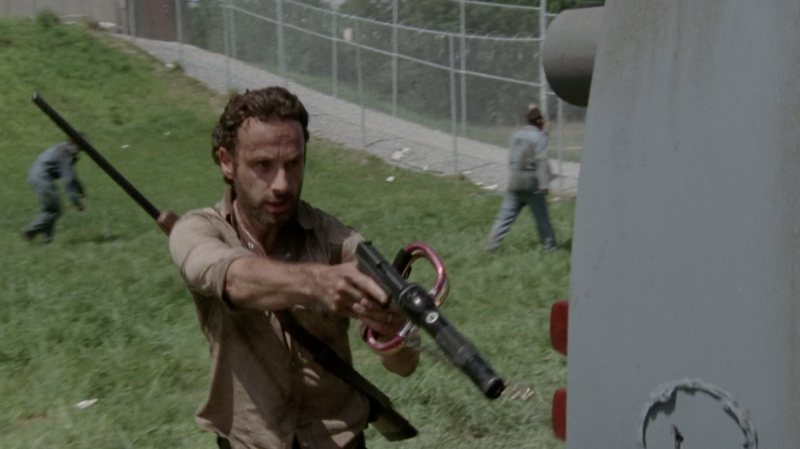 For example, in the opening episode of the show’s third season, Rick is shown clearing the prison field with the group using a hollowed-out flashlight for a suppressor on his pistol. Seasons later, paintball/airsoft armour is displayed proudly as defensive garments for warriors of The Kingdom. The continuing need to outfit the group with suitable supplies drives the scavenging motives ever forward; the developer in charge of character equipment progression would also need to prove competence in handling the minutiae of every little piece of junk strewn about the apocalypse. Giving some attention to my historical experience with Bethesda games (notably Elder Scrolls III-V, Fallout(s) 3, New Vegas, and 4), a bit of anecdotal experience may contextualize just why I would love for one of my favourite developers to take on a great, rich IP such as The Walking Dead. In each of the six games listed above (three each from Elder Scrolls and Fallout franchises), the player is guided through a brief introduction to the storyline and mechanics before being placed in front of a crawling expanse, free to explore at their own leisure. In Skyrim, the player can conceivably avoid the entire main storyline until long after they’ve become the respective leader of the Mages’, Fighters’, Thieves’, and Assassins’ guilds, at which point dealing with the dragon invasion and end of the world seems no more daunting than any other week’s work. Similarly, in Fallout 3, the player does not need to take the first step towards finding their father until the other 95% of the game has been completed. It’s that overwhelming removal of guidance that makes Bethesda games so special; the game experience is woven into a tapestry of individual tales that have each contributed to a greater whole. The Walking Dead could use that, and in droves. Rick wakes up in the hospital, near-naked and alone. He navigates the hospital walls, uncovering the context for the hell he’s found himself in, coming to terms that some pandemic has ravaged the population and that things are in widespread unrest. Shortly after leaving the hospital, he encounters the first NPCs of his journey, one of whom gives him the necessary training to understand the situation he’s faced with. And, after picking up preliminary supplies, they’ve gone off in different directions, leaving Rick to his big ‘Where do I start?’ moment. Setting aside specific details, this story summary is mirrored well by both Oblivion and Skyrim, and is not all too dissimilar to New Vegas as well. What if Rick decided that Atlanta/the CDC was too much for him to handle and he went in another direction first? That simple question befalls every player of Bethesda games that take even a moment’s pause to assess the situation before chasing down the main story’s objective marker. Of Bethesda’s extensive history building open-world RPGs, the most comparable IP to draw influence from is the Fallout series; considering its own post-apocalyptic setting and game design. The world has gone to hell, and only the most resourceful manage to scrape out a life amongst the dangers of the wasteland. Many parallels can be drawn between the two universes, despite how dissimilar their executions may be. At the risk of approaching a proposal for a re-skinned version of Fallout 4 (and its predecessors, by extension), we can look at several mechanical examples drawn from the game to see how well the gameplay elements translate to a zombie-apocalypse universe. In using established mechanics present in-engine, Bethesda Game Studios would then be able to cut down development time and prevent some growing pains that would inevitably work their way into the fresh-built technology. 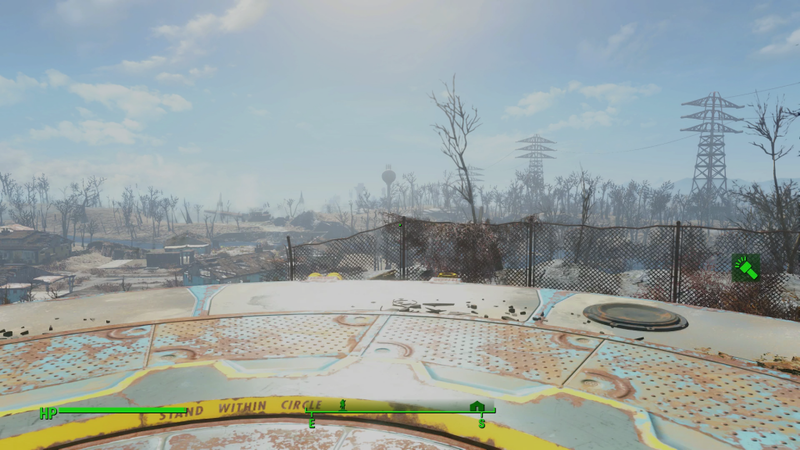 Full-on settlement construction a la Fallout 4 would feel right at home for a zombie-themed game, as it takes established convention and drives it forward a good few paces. Years past have given numerous titles prompting ‘Hold Y to barricade window’ or sending the player character(s) on scavenging runs for consumable supplies that must be continuously replenished (State of Decay employs both tactics to some degree in its community management). 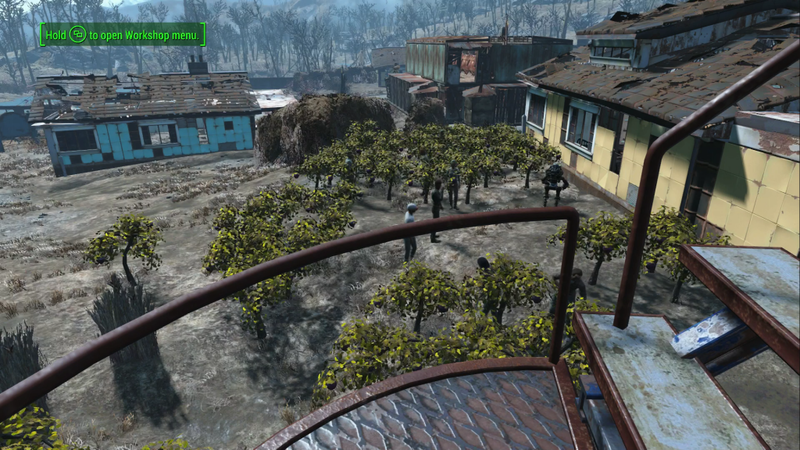 By making use of Fallout 4‘s mechanics, however, population can be steadily grown as sustainable supplies are retrieved or grown/built. Briefly consider the survival of Rick’s group in the prison during The Walking Dead‘s third season. They had the early workings of a farm by means of humble crops and a handful of animals, but supplemented it with scavenging runs for supplies that could not be grown or assembled from available scraps. Moreover, consider Woodbury (third season), Alexandria (fifth season – ongoing), or a number of other survival outposts (such as the ‘Saviours’) featured in the show, a number of defensive design elements are shared amongst them: scavenged materials can help put up the all-important walls and keep zombies at bay. These mechanics would be perfect to bring that element to ‘life’ in a new The Walking Dead game. Integral to the weapon diversity in Fallout 4 is the construction system available on all of the weapon workbenches found in-game. Assuming the player has put points into critical skills (Guns, Armour, Science), weapons and skill-relevant mods become available for outfitting. Early-stage gunplay makes heavy use of the new-to-franchise ‘pipe pistols’ which have seemingly been constructed from an erratic run through a hardware store. They are exceptionally common, output mediocre damage, and have a number of mods to offer that help cater the weapon towards the player’s style of combat. Switching the stock for a more compact grip changes the weapon from a rifle into a pistol (or vice-versa), and the barrel, muzzle, magazine, sights, and receiver can all be tweaked/replaced to change how the gun is used. Before mods can be built for weapons and armour, however, the player must have accumulated suitable amounts of varying bits of junk. Once the components have been gathered and the pertinent skill points unlocked, the weapons may be modified and built to the players’ liking. This would perfectly mirror the need to scavenge that the characters face in The Walking Dead. Granted, guns are guns, not to be made or deconstructed, but more often than not a member of the cast is seen brandishing some unconventional approach to weaponry; especially with respect to melee weapons. These are often cobbled together (one lady wields a spear made from a chisel and a broomstick), but generally work out to be useful in a pinch. 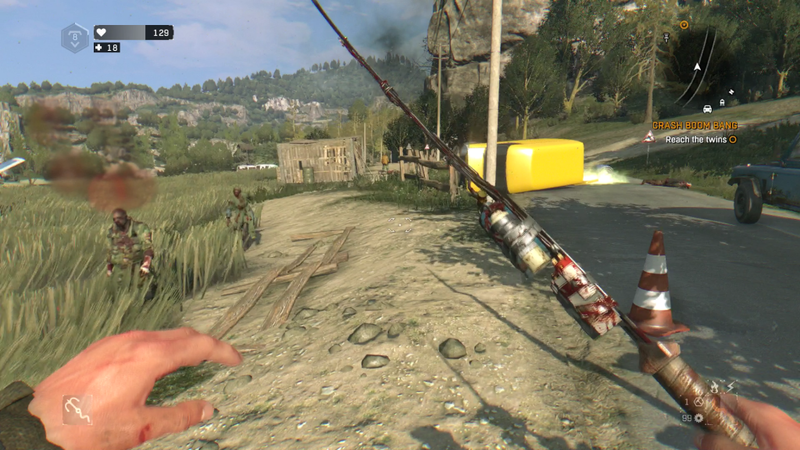 Other developers have delved into customized weapons in zombie games, of course, with notable mentions going to Capcom for the combo weapons of Dead Rising and Techland’s focus on melee game mechanics in their Dead Island/Dying Light. The former makes use of a broad albeit shallow crafting system (using specific recipes in earlier titles and matched item types in later entries), whereas the latter deviates some from reality through elemental augmentations placed on weapons. Neither of these examples truly drive home how desperate survivors would assemble an arsenal in the zombie apocalypse, but the promise shown in Bethesda’s weapon crafting mechanics could pander directly to the niche where scavenging and construction overlap. As a huge fan of all (most) things Bethesda and of AMC’s The Walking Dead, it pains me to acknowledge that there are, of course, areas where the developing staff may fall short of my admittedly-lofty expectations. Interpersonal relations in Bethesda games can often come across as a shallow exchange, but this seems like a Catch-22 situation if previous titles are to be used as a reference for what could be in this theoretical open-world zombie killer. While The Elder Scrolls entries have all featured a silent protagonist, the latest entry in the Fallout franchise threw out their playbook for a voiced protagonist. This change was met with mixed reviews, which poses some difficulty for whomever finds themselves in charge of inter-character development. Silent protagonists reacting via chat wheel limits the emotional exchange between two characters, but a voiced protagonist, if mismanaged, can pull the player right out of the required immersion. Bethesda may find themselves in a damned if you do, damned if you don’t situation with respect to character development. Even in the face of potential pitfalls, an open-world game using Bethesda’s Creation Engine could be rapidly patched, modded, expanded, or otherwise enhanced through the modding community’s use of the Creation Kit; official tools that serve to supplement Skyrim (including 2016’s Special Edition) and Fallout 4 with a vibrant online directory of mods. Were it to be such that avid enthusiasts of the modding community overlapped with fans of The Walking Dead, the possibilities for an ongoing flow of content (official and otherwise) would be sure to keep owners of this theoretical game returning for more. This is just the beginning of what we hope to be a enjoyable, ongoing series that looks at the strengths (and weaknesses) of a given developer, based on previous performance, and the potential of providing them with a new challenge. Be sure to join the discussion on Twitter to let us know who else you think would be a good match to look into; it might just form the basis of the next cross-examination.